After ringing in the New Year and toasting to 2014 with guests both new and old, we quickly rolled up our sleeves and began work on property improvements to The Reefs Resort & Club, gearing up for the upcoming season. Every year we strive to improve the resort based on your feedback and our desire to keep the property looking and feeling as fresh as possible. This year we are excited to share with you a few great updates to your favorite Bermuda resort. As some of you who visited us this past year and stayed in our Cliffside rooms are aware, we began remodeling half of the bathrooms during the winter of 2013. This winter, we will complete the project and will finish up the remaining 12 Poolside bathrooms. 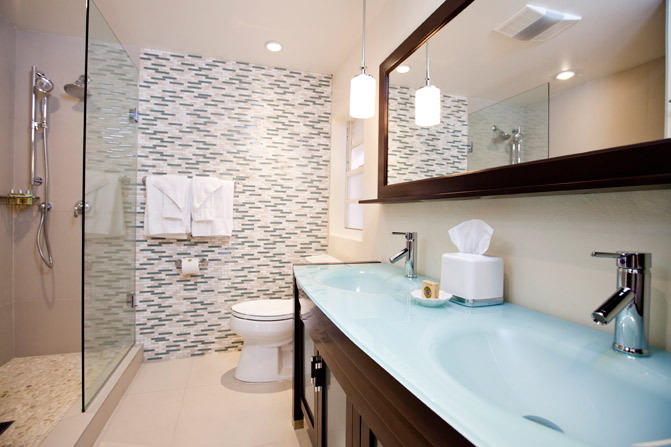 From the beautiful blue glass double-sink vanities to the sleek glass tiling, not to mention the gorgeous travertine floors, these upgrades will make it hard for you to leave your room! Also getting a refresh are our Junior and Point Suites. We're updating a few furniture items as well as the some new soft goods including window treatments, rugs, etc. We look forward to welcoming you back to your favorite rooms to notice these new additions in addition to the beautiful views the rooms afford. Sadly this past winter our Executive Chef Carl decided to head back to Dubai to take a new job. We are now in the process of hiring a new Head Chef who will be on-property as the weather begins heating up. Don't worry though, this just means that you foodies will have new dishes to look forward to at your favorite restaurant while still savoring your favorite classic Reefs meals! Stay tuned for more culinary news as we head into the spring when we announce the new Chef. The award-winning La Serena Spa has also updated its Spa Menu for 2014. Check out our new spa treatments and don't forget to book your appointments when you book your next trip. We look forward to welcoming you back to The Reefs Resort & Club in 2014 to check out all the new updates for yourself this year!